I've made a terrible oversight and I apologize. I'm here to rectify it. In my zeal to show you my giant bunch of kale, and my new favorite breakfast, I forgot to tell you about why I'm actually buying unnaturally enormous bunches of kale in the first place. For those of you who have yet to be indoctrinated into the wonders of this borecole (the un-common name for this particular member of the cabbage family), here are a few good reasons why you might want to try this stuff out. First off, it's been insanely hot in Wisconsin this summer (while we were away in Vancouver one friend even said the rubber handle bars on his bike melted off!!) and my tolerance for standing in front of a hot oven is just about zero. Giant salads make great meals as far as I'm concerned! But most importantly, kale is ridiculously good for you. 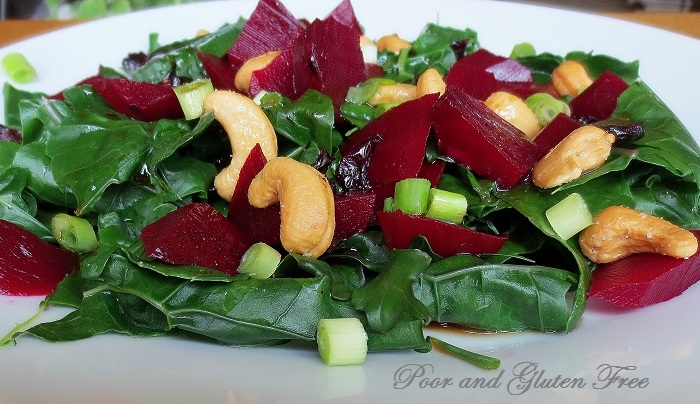 It is the super food of greens, and many other veggies, too. There is a lot of healthy bang for a little bit of buck with these. A good sized bunch will usually cost you between $1 - $3 (yes, that's even for an organic bunch) and they keep well in the fridge. They are extremely high in Vitamin A, C and K (1 cup of steamed kale contain 354%, 89% and 1328% respectively of your daily recommended value) along with a variety of other good-for-you minerals and nutrients. It's very antioxidant rich and helps to lower blood cholesterol levels. Kale can be used in almost any way that you use other greens; in salads, baked in casseroles and lasagna, baked on their own as chips, on pizza, in soup, steamed as in last week's breakfast on toast with a poached egg and steamed as in today's salad! FYI: there are several varieties of kale, and some are more bitter and tough than others. In general kale on its own can be a bit bitter so if you're having it raw in salads you may want to mix it with other greens. Steaming, boiling, baking, marinating or massaging kale can soften the leaves and remove the bitterness. This recipe actually came about last week as a result of your comments! I had asked you all what you like to do with kale, and one loverly friend commented that she has it steamed in salad with beets, olive oil and lemon juice. I had beets in the fridge and thought I'd play around with the combo. 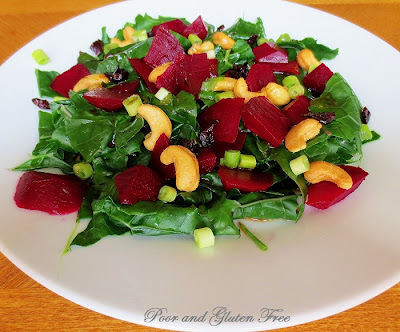 I like beets in salad, and meal-sized salads, and actually have another beet salad recipe posted on the blog that includes quinoa and bocconcini. So anyway, I played around with the idea of beets and kale and decided to use a sweet dressing instead of an acidic one, because I was craving something sweet. What I came up with has become my staple lunch for the past week!! 1. 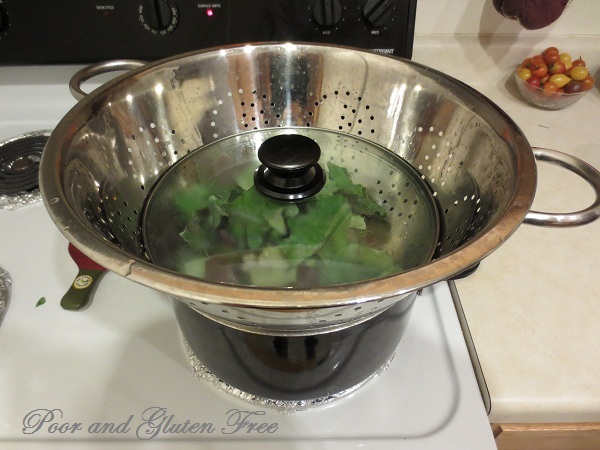 Steam the kale in a steamer or using a metal strainer set up over a pot of boiling water with a large lid on top. Add only about 1-2 inches of water, so that the water does not touch the bottom of the strainer. Steam about 2-3 minutes, until the kale is bright green and wilted. 2. Arrange kale on a plate. Slice beets and arrange over the kale. Sprinkle with cranberries and buts. 3. In a jar with a tight fitting lid, mix the dressing ingredients together up to the honey. If the honey does not dissolve, heat the jar in a microwave approximately 15 seconds, and give the jar a shake to mix all ingredients together. Drizzle over the salad and enjoy! *OAS Info: The Tamari sauce, while gluten free, is not soy free. While some people with soy allergies can handle soy sauce because of the processing it undergoes, if you have a problem with soy you may want to substitute something like coconut aminos or fish sauce. With a bit of searching, you can find recipes online for gluten free, soy free soy sauce. If you have problems with honey you could sub brown sugar instead. I hope you enjoy it if you do decide to try it! Such a pretty salad! Love kale. Just found your site! My mother-in-law has celiac, so I'm loving your recipes! Perfect photo! I love the addition of the nuts and sounds so easy to throw together. Thanks for sharing this week in our linky! Here's to hoping you have a great weekend! !